In 2013, Jarret Martin's career was revitalized by a move to the bullpen. On Thursday, it might have gotten another shot in the arm with a move to a new organization. Along with outfielder Matt Long, the 25-year-old left-handed reliever was traded from Los Angeles to the Brewers in exchange for catcher Shawn Zarraga, the clubs both announced on Twitter. The Dodgers said immediately beforehand that Long had been acquired from the Angels to tie up the loose ends of a deal for Drew Butera earlier this week. Martin was considered the No. 20 prospect in the Dodgers system at the time of the deal. An 18th-round pick by the Orioles out of junior college back in 2009, he went to the Dodgers in a December 2011 deal that sent fellow southpaw Dana Eveland to Baltimore. 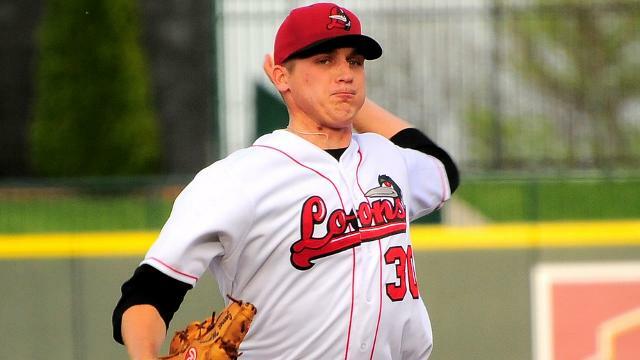 He struggled as a starter in the lower levels of the Dodgers system, posting ERAs and BB/9 rates north of 4.00 and 5.0, respectively, in his stops at Class A Great Lakes and Class A Advanced Rancho Cucamonga in 2012 and 2013. The left-hander moved to the bullpen in June 2013 and saw improved results. He posted a 3.29 ERA with 64 strikeouts in 54 2/3 innings this past season for Chattanooga in his first season at the Double-A level. His walk numbers, however, continued to be extremely high: an average of 7.9 batters per nine innings. Both righties (.176 average) and lefties (.194) found him difficult to hit, although right-handers walked significantly more (9.7 BB/9 vs. 4.4). Martin earned a spot among the Dodgers' top 20 prospects, thanks to a 65-grade fastball that sits at 92-96 mph, according to MLB.com, and a 55-grade slider. That stuff could be good enough to earn a Major League look with Milwaukee in 2015, although he'll need to work on his control if he is indeed to rise above the Double-A level. Long, 27, split time mostly between Double-A Arkansas and Triple-A Salt Lake in the Angels system in 2014, combining to post a .249/.340/.384 line with 10 homers and 25 steals in 116 games. He played at both levels each of the past three seasons, swiping more than 20 bases each year, but wasn't able to crack the Majors after six seasons with the Angels. Zarraga broke out at the plate in 2014 by batting .330/.440/.419 in 75 games for the Brewers' Double-A affiliate in Huntsville. The 25-year-old backstop hit just .213 in a short 17-game stint with Triple-A Nashville. He'll help out the Dodgers with catching depth at the higher levels of the Minors with the club expected to send Tim Federowicz to the Padres in the anticipated Matt Kemp/Yasmani Grandal deal.